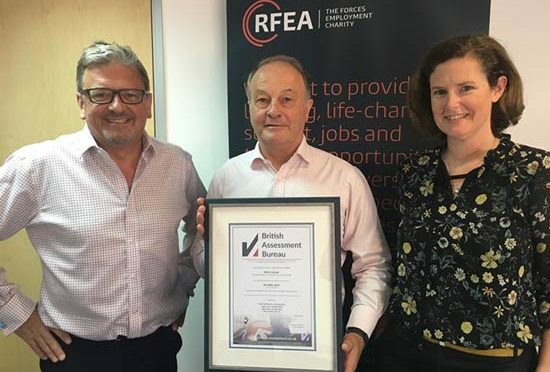 RFEA, the Forces Employment Charity, is proud to announce that it is now certified as an ISO 9001:2015 compliant organisation. The certification was accredited by the British Assessment Bureau on 25th April 2018. To become certified as ISO 9001:2015 compliant, RFEA underwent a rigorous and exacting evaluation process designed to meet compliance within the ‘International Standard’. This work involved the creation of a defined Business Management System (BMS), a management system documentation review, a pre-audit, clearance of non-conformances and a final certification audit. The ISO 9001:2015 certification of compliance recognises that the policies, practices and procedures of this charity are built on internationally recognised best practice to ensure a consistent quality of delivery to our clients. In order to maintain certification, RFEA will perform a series of scheduled audits to ensure compliance is continually maintained by identifying and rectifying non-conformances, evaluating risks and regularly assessing initiatives for continued improvement. It is understood that RFEA is the first UK Military Charity to achieve this internationally recognised certification.